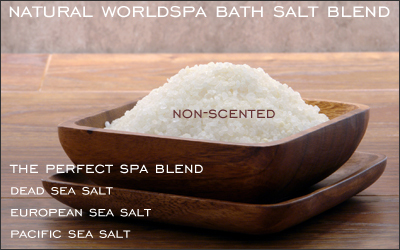 Our WorldSpa blend of salts is one of our most popular in-house natural blends of bath salts because it combines the benefits of 3 very different & unique salts: 33% Dead Sea Salt, 33% European Salt and 33% Pacific Sea Salt. With the variety of salts that make up this special blend as well as the quality-to-value ratio, this combination of salts has been very popular among our customers. This blend is ideal for spas and salons, re-packing with your own scent, skincare, detoxing, skin softening & to generally soothe muscles aches & pains - This is the perfect natural salt if you can't seem to make up your mind on a specific one or if you want the best of ALL Worlds! 3 different luxury spa salts - this is the perfect blend. Our Worldspa blend of salts is one of our most popular in-house blends of natural bath salts due to its diversity to cover all areas of bathing. Dead Sea Salt - Mineral rich salts from the Dead Sea. Ideal for skincare and detoxifying. European Sea Salt - One of the purest salts in the world from the pristine waters of the Mediterranean Sea. Pacific Sea Salt - The perfect combination of Quality and Value. Softens skin and relaxes tired and achy muscles. Origin: Israel, Europe, & USA. Ingredients: Pacific Solar Sea Salt, Dead Sea Salt, & European Spa Salt.